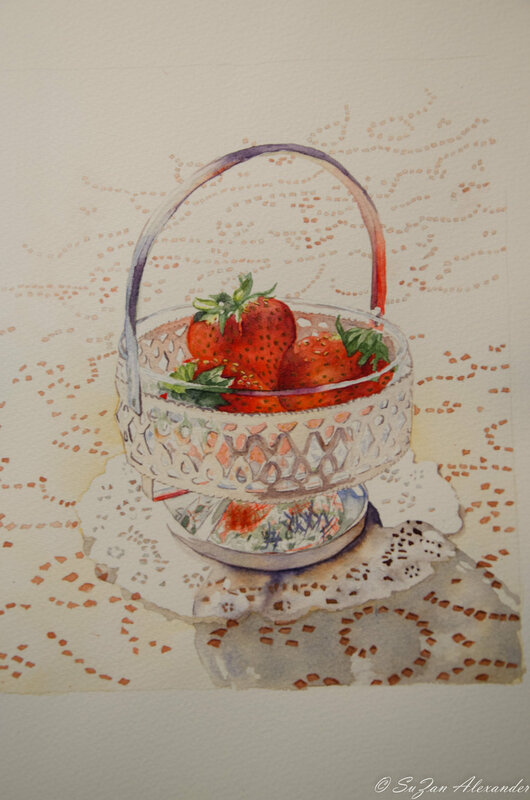 Project 8 from Step-By-Step Guide to Painting Realistic Water Colors by Dawn McLeod Heim is Strawberries and Lace. I know you should never say never, but I HOPE I never revisit this little exercise again. This exercise was all about the strong morning light, painting intricate reflective objects, and making the strawberries look like ripe, juicy strawberries. If I were grading, I’d give myself a very strong, solid D-. It looks very “amateurish” to me and couple that with the fact that I barely got this finished in time to post… I do, however, like the cast shadow from the basket. It is very unlike the example, but I think it’s the only redeeming passage of this bad boy. I could go back and make some areas stronger, but this one isn’t going anywhere, so, why prolong the frustration any further. I hope that feeling frustrated means you are growing and learning because this one held a few of those moments for me. I’m glad I committed to posting these lessons to hold myself accountable, because I’m pretty sure this is where I would have put the book back on the shelf if left to my own devises.